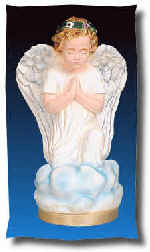 Religious Lawn and Garden Statue's are great for indoor or outdoor use. Preserve the spirit of your faith with a symbol of religious devotion. Our commitment to quality is reflected throughout this entire line of spiritual items. Religious statues are carefully crafted to complement your decorum. Pigment colored plastics are molded in an exclusive process, for years of lasting use. Whatever the occasion, you'll find an inspirational item at an affordable price. Catholic Religious Lawn and Garden Statue's are great for indoor or outdoor use. They also make Great Gifts! Showcase your expression of faith with traditional religious statues. Every statue in our complete line stands for fine design, quality, and craftsmanship. A perfect gift for someone who really cares. 24" Motiff shown is just $89.95. Also available in White $59.95, Granite $69.95, 24" Patina, Bronze or Wood $89.99. For greater spiritual enhancement, may we reccommend a Grotto for 24" motiffs? Click the picture for a larger view of this item. SAP 2430C Colored Kneeling Angel, 16 inches tall.